✅ 12X50 High Power Magnification: Aiqiying monocular telescope has the best view in your outdoor adventures. To see 12X closer with a clear and bright image with the generous, light-gathering 50mm objective wide lens. Ideal for outdoor enthusiasts and wilderness explorers, a handheld and must-have for bird watching, wildlife, hunting, hiking, mountaineering, camping, surveillance and traveling. 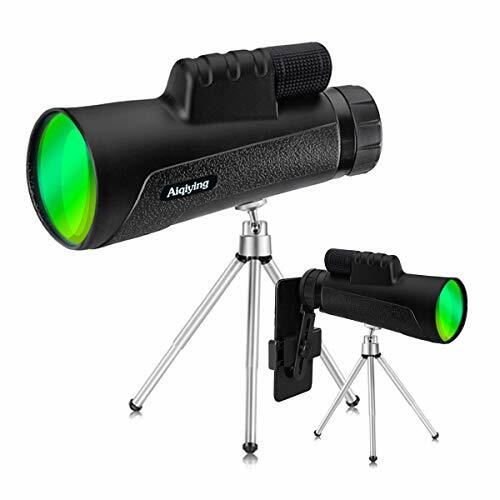 ✅ Low Light Night Vision: The monocular is made of high quality material, all-optical FMC multi-layer broadband green film coated with BAK-4 prisms. High light transmittance reaches up to 99.5%. Multi coated optics guarantee superior light transmission and brightness. Low-light-level night vision built-in design help you see things in low light. ✅ Perfect Cell Phone Accessories: Universal Smartphone Adapter, Monocular Telescope can clear and remote view of the scene, taking pictures and routes, compatible with iPhone, Samsung, LG, Sony and almost all other smart phone on the market. Besides, extendable stable tripod and phone clip that help you to get a HD image or video easily, and share with your friends. ✅ Waterproof & Fogproof Design: Nitrogen-filled waterproof and O-ring sealed design,Ensures the living Monocular Telescope waterproof function. Aiqiying Monoculars Also prevents dust and debris from getting inside the monocular - designed to inhibit internal fogging. For any weather and any environment. ✅ Easy to Use & 100% RISK-FREE SATISFACTION: This monocular telescope with stripes is convenient and comfortable to use by single hand and keeps Monoculars from slipping out from your hand. Adjust New Larger One-Hand Focus Wheel easily, you can get high definition image easily. AiqiyingOptics provides ONE YEAR warranty and 60 days no-reason return of the product. Save an extra 20% when apply a coupon at the same time.